"Dr. Royall and his staff are excellent." 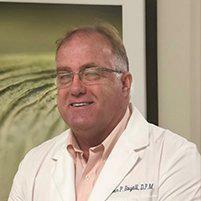 "Dr. Royall is a wonderful and knowledgeable physician." "The office is so beautiful & very clean." "You really feel like you are part of a family here." "Dr. Royall great! Humorous, informative and very personable." Dr. Steven P. Royall, DPM, has a special interest in sports medicine, stemming in part from his love of snowboarding on the beautiful Utah mountains. He enjoys treating athletes and is passionate about keeping his patients active while they heal. Many traditional podiatry treatments involve painful surgery that takes months of recovery time. Dr. Royall is board certified by the American Board of Podiatric Medicine, and continually receives training in new, minimally invasive treatments with much faster recoveries. He focuses on current and traditional research to advance the care of many foot and ankle pathologies. He’s served as team podiatrist for the world recognized Major League Soccer Cup Real Salt Lake professional soccer club and is currently the company podiatrist for Ballet West, a professional dance company. Dr. Royall received his Doctorate in Podiatric Medicine and Surgery from Des Moines University’s College of Podiatric Medicine and Surgery. He completed his first residency at the Veterans Administration Medical Center in Tucson, Arizona. During a second residency, he specialized in the surgical treatment of complex foot and ankle conditions at the Veterans Administration Medical Center/Salt Lake Surgical Center in Salt Lake City, Utah. He graduated from Brigham Young University with a B.S. in Microbiology. Originally from the Los Angeles area, Dr. Royall has been in private practice in the Salt Lake City area for over 25 years. He loves to travel with his wife of 33 years, Tracy, and is an avid woodworker when time permits. Dr. Royall has three children and two grandchildren who keep him busy when he’s not at the office. We accept the vast majority of health insurance plans, although we do not accept SelectMed or Medicaid. If you do not see your insurance providers, or if you have any questions, please call our office. "The service was great. Dr. Royall set my mind at ease about my broken ankle; I was really worried about it and he was calm and collected when I left the office." "I have had a great experience with Dr. Royall and his staff. He provides excellent care."